Designed to replace the new "one piece" handlebar clamp on Yamaha Road Stars 2004-2012, 1100 V-Star "Classic" 2005-2012. Works with or without windshield. 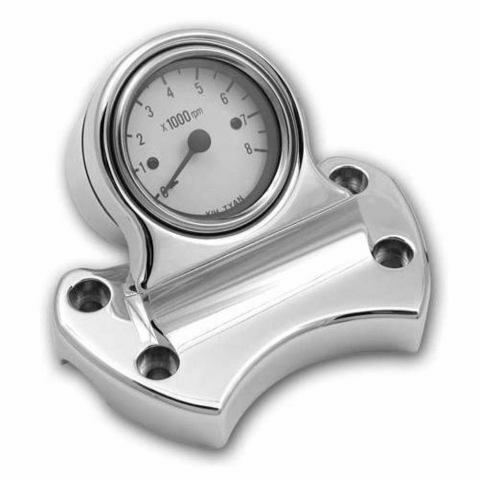 Includes Tach, Chrome Billet Tach Mount, Handlebar Clamp, and Cup. Easy To Install. with no wires to splice. Easy plug-in installation. Comes with all necessary hardware, connectors, and complete instructions. CNC Machined from Billet Aluminum. Triple Chrome plated. Includes White Face Electronic Tach. Works with or without windshield.